Conference Venues SA has added Germiston Golf Club to their list of conference venues in Germiston. Conference and Function Facilities. Seating for 100. Tranquil and private setting with spectacular views over the Victoria Lake “The Gem” as it is known to many, boasts upmarket function venues with the most amazing views overlooking the Victoria Lake. There are three separate venues ranging in sizes. The maximum capacity is 180 people banquet style with a dance floor. A fully qualified Functions expert to see to all your function requirements and all catering is done on site by capable staff and waiters are fully trained to serve your guests. Conference Venues SA welcomes Ancient Windmill to their list of conference venues in Fourways. The River Cabin has one venue with a balcony and a huge garden that can cater up to 100 people in doors and 500 people out doors. There is not any accommodation on the premises but there are lots near by that can offer a shuttle service. There is wild life on the property and a stunning river that flows through. You feel far away from the city but we are just 20 minutes from Fourways Mall. Its very peaceful and tranquil. The River Cabin with the beautiful Jukskei river running through and gorgeous scenery. This is an ideal venue for creating that outdoor setting and experience that make our summer days well worth it. Our team excels at putting together events, with over 40 years combined experience and a multi-generational team. We can plan the ideal event for anyone. 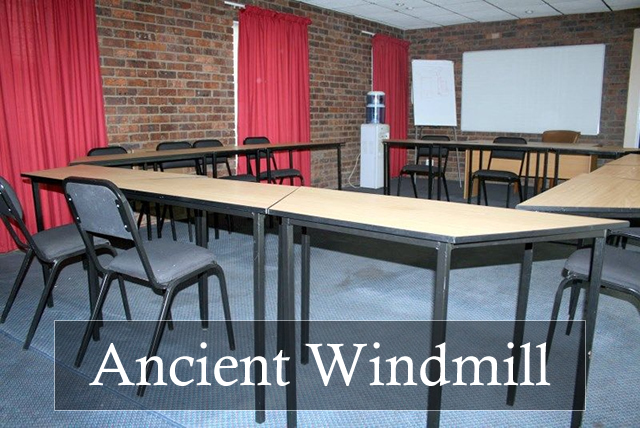 Conference Venues SA welcomes Ancient Windmill to their list of conference venues in Benoni. Ancient Windmill is situated 13 Kilometers from the O.R. Tambo International Airport and close to the Ebotsi and Serengeti golf clubs. The venue has two conference centres that can each seat approximately 60 delegates. Each conference centre is equipped with its own entrance, bathrooms and kitchen, and an indoor braai. Ancient Windmill conference venue cater for small functions such as training sessions, baby showers, high teas, kitchen teas, year-end functions and birthday lunches. Accommodation is available in the form of seven rooms for up to sixteen guests. Rooms have free Wi-Fi, workstations, tea and coffee, and some rooms are fitted with microwaves and bar fridges. Choose African Leadership Academy as your venue for your seminar, conference, company function, training, workshop, team building event, cocktail party or private function. Set in a tranquil environment in Honeydew only 30 minutes from Johannesburg, the campus of African Leadership Academy Conference Centre provides a relaxed atmosphere where our guests can conduct work without distractions, celebrate a special occasion or comfortably relax. The modern function and conference facilities can accommodate a group of almost any size, while attentive staff provide the services you require. Whether you come to African Leadership Academy to host your next event or just to explore the surrounding area, we will help you get the most out of our peaceful yet expansive grounds. African Leadership Academy’s modern function and conference facilities can accommodate a group of almost any size. There are 4 conference rooms, 9 breakout rooms and a 350-seat auditorium. The outdoor spaces and sports grounds are perfect for your networking function, team building and braai. The 2 intimate dining rooms and large dining hall are suitable for your business lunch and function. African Leadership Academy offers campus-wide wireless internet, visual projector, screen, flip chart and white board in each meeting room. There’s also free parking and 24-hour security on campus. Auditorium: The 350-seat auditorium is ideal for large functions. The foyer is also ideal for tea breaks and networking exhibitions. Executive Boardroom: The executive boardroom looks out over the lawns of the campus and includes a projector, wireless internet, and flipcharts. Breakout Rooms: There are a number of meeting rooms seating between 8 and 35 people. Each room includes flipcharts, visual projector and wireless internet. Sports Facilities: The outdoor meeting areas, soccer field, basketball courts and tennis courts serve as perfect venues for team-building events. The professional chef will customize a menu to according to your budget and taste. Enjoy either the main dining hall, which seats 300 guests, or the 2 intimate dining rooms, which seats up to 70 guests. African Leadership Academy’s in-house catering service is run by an international catering company providing anything from a full menu to light snacks.